We like that this shed takes the traditional good looks of a rustic garden shed, a mainstay of British gardens for decades, and combines it with the advantages of a metal garden building. It looks stunning, thanks to its shiplap style cladding that’s been powder coated with tough and weather resistant green paint. Both of these factors, the paint itself and the shiplap cladding, help to prevent water getting into the shed itself, which is very reassuring especially as it’s backed by a 12 year warranty against the occurrence of damage caused by rust. Weather protection is also aided by the hot dip galvanisation used on the cladding. It means that it’s tougher than it looks, and although feeling flimsy during construction it was tough and solid when assembled. Another feature that we appreciated was the tall headroom, far in excess of many other metal sheds that we review. When combined with the accommodating width and depth it means that you can store a lot inside. We can even imagine it being used to store motorcycles, and the window free design means that nobody will know they’re inside, giving them extra security although we would also recommend adding a good quality padlock. Once installed, the good looks of this apex shed certainly caught our eye, and it’s sure to have that effect on many people. The rustic shed design is a timeless classic, and from a distance the shiplap style cladding really makes it look as though this is a timber shed. The forest green paintwork is immaculately applied across the whole of the exterior, excepting the roof, although the interior is painted in a white colour to create a lighter, brighter space. The apex roof is made up of two translucent panels, and it means that rainwater slides harmlessly away. 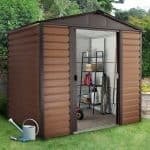 It also adds extra height, meaning that this metal shed is taller than most we review. The ridge height is 2.24m, and the eaves height is 1.83m, which equates to six feet. 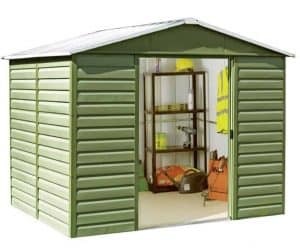 The overall width of the shed is 3.03m and the overall depth is 1.97m, so your base will need to be a minimum of this size. During assembly we found the cladding to be quite thin and light, although the frame itself was noticeably thicker, so we were pleasantly surprised at how stable and secure it felt when assembly had been completed. This is testimony to the strengthening factor which comes from hot dipped galvanisation, so you won’t need to worry about your shed staying intact during strong winds. 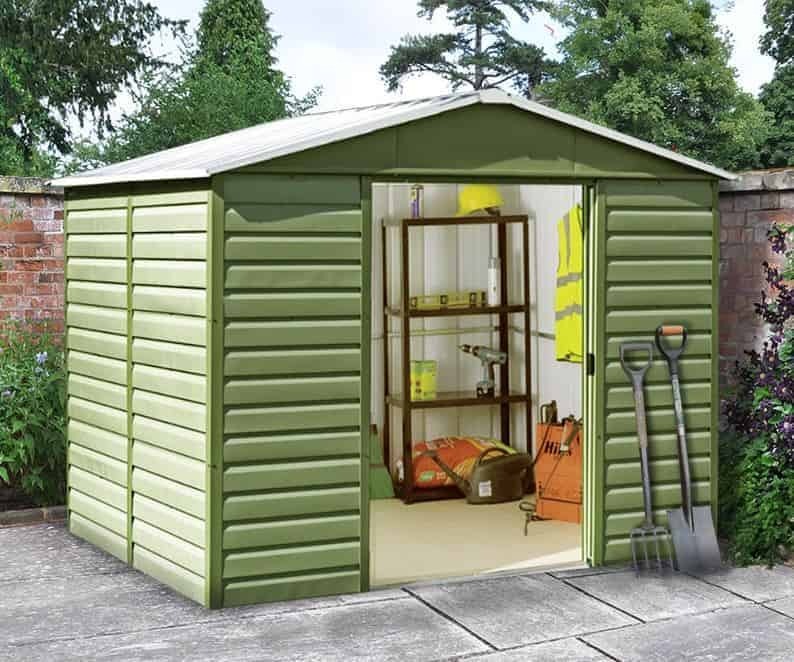 As with most metal sheds we review there is no floor, as this is designed to be screwed directly onto a suitable pre-existing base, ideally made of concrete. We were pleased to find an anchor kit with expansion screws included as standard, and also to find that all screws supplied in the package are themselves rust resistant. Thanks to the high quality galvanised cladding, and the natural rain repellency supplied by both apex roofs and shiplap, we feel that the warranty provided could have been even longer. Nevertheless, the 12 year warranty against perforations caused by rust is still more generous than some we find on metal sheds. Being metal, there is, of course, no treatment required by the owner of this shed. The double sliding doors were yet another feature that we rated highly. Their dimensions are very generous, with a width of 1.25m and a height of 1.78m. This makes it easy to move objects of any height, width, or shape in and out, increasing its versatility as a storage facility. It was also good to see that the sliding mechanism is hidden inside the shed, creating greater protection against accidental or malicious damage. Whilst there are no windows on this shed, we found that an ample supply of natural light came in thanks to the translucent roofing panels. This makes a big difference, especially as the white walls make the most of this light. 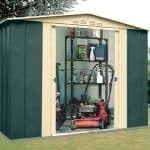 For this reason, it would even be possible to use this shed as a place to carry out work. With shed security becoming ever more important we were pleased to see that the handles are holed and ready for a padlock to be fitted, although we would have liked to see a padlock supplied with the shed as standard. One inbuilt security feature, however, comes from the window free design. It means that opportune thieves will have no way of knowing if anything valuable is kept inside, making it more likely that they’ll pass it by. The interior fitting of the sliding doors also aids security by making it harder to breach them. 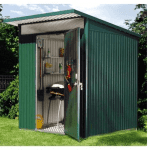 There are four optional extras included with this shed, including a high quality wheelbarrow, a tool rack with fitted wheels, and a water station for greener watering of your garden. What we especially liked was the versatile set of racking, measuring 2’6 X 1’8, which is strong and stable and can be placed anywhere inside the shed. It’s an ideal place to store small tools or tins of paint, keeping the floor free for larger goods. 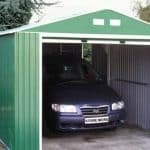 It was obvious from first sight that this was a high quality metal shed, and this was confirmed during the course of our review. Each piece is well machined, and the finish applied is excellent. The shiplap nature of the cladding makes it hard for water to get inside, as does the apex roof, so this results in increased structural durability. We were surprised how much we could fit inside, and this is because of the wide and accommodating doorway and the extra height from this taller than average shed. The instructions themselves could have been a little clearer, especially as there are a lot of small parts involved. It took two of us just over four hours to construct, and the most difficult part is the lifting and positioning of the roof panels. 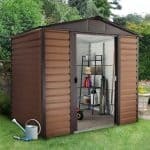 A slightly longer warranty period would have made this even better value for money, but as it is this is still very good value for a shed you’ll be proud to have in your garden. 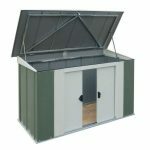 Final Thoughts: If you’ve never owned a metal shed before, then this could be the one to convert you. It has the beautiful rustic appearance that you’d associate with a timber shed, and yet it doesn’t require the time and expense that are needed to carry out the annual preservative treatment that wood requires. We found it very accommodating, and it was a relief not to have to bend down when walking through the door. We also welcomed the light that naturally illuminated the interior thanks to the clear yet tough roof panels. It gives the advantages of a window, without the compromise to security that windows can sometimes bring.